Via Planet Iacon on Facebook we have learned that in addition to this year’s Asian market reissues of the Masterpiece series Transformers, in 2015 – to coincide with the 30th anniversary of Transformers releasing in Japan, possibly – Takara-Tomy will be reissuing four of the Masterpiece series Transformers. 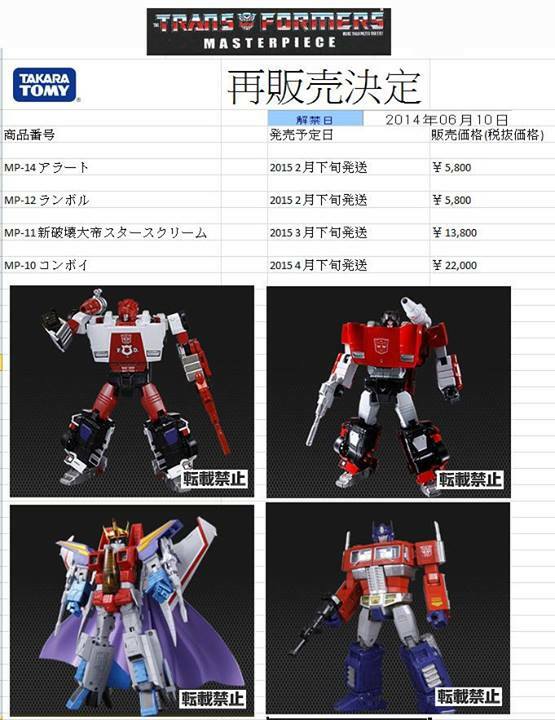 The four to be reissued are MP-12 Lambor / Sideswipe and MP-14 (Red) Alert in February 2015, followed by MP-11 Starscream version 2 in March 2015 and then to top it all off, MP-10 Convoy version 2 will be reissued in April 2015. These reissues are almost a year away – but that means more time to put aside some money if you missed out on these guys the first time out. Man, that mp14 reissue was really silent. I was hoping on getting one but I never noticed it's release. They are still crazy expensive on Ebay. Red Alert was never reissued by Takara that I know of, but BBTS has stock still of the last reissue from a year or so ago from Hasbro Asia, same figure and all. yeah… bbts only seems to have Hasbro Asia stock up. Well to my knowledge MP 14 was not reissued. I suppose Hasbro Asia might have done something, but Takara certainly didn't. He probably linked off an old thread and didn't realized it had been moved/merged. Err.. as rthis is the 3rd party forum. Are you all talking about the KO's? No. This is not the 3rd party forums….. I like me a MP-10 v3 KO.. Is it available already?? And what 3rd party company makes it. What websites should I eye on when it is available. Aliexpress perhaps? This is the news and rumors section, not 3P section. Could you clarify if this one happened? I am getting mixed information out there, being a newbie collector. I want to make sure to pick up a MP-11 TT Starscream that doesn't have the torso connection problem. The current TRU Masterpiece Starscream is good and tight , tightest of all the MP11molds, and is only $60. My reissue Prime is pretty sweet – love everything him EXCEPT silver roller. My roller needs to be blue. Date stamp on barcode should be an indicator, if that's any help to you. 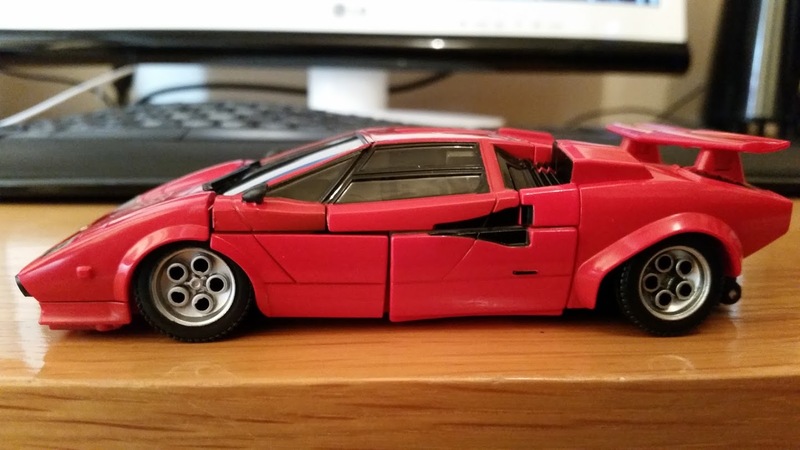 Now that Sideswipe is available again and thanks to the photos that Chiller posted, I ordered one at Kapow last weekend. I picked up the package at the post office today. It is a very nice mold. The chest does not bother me at all. 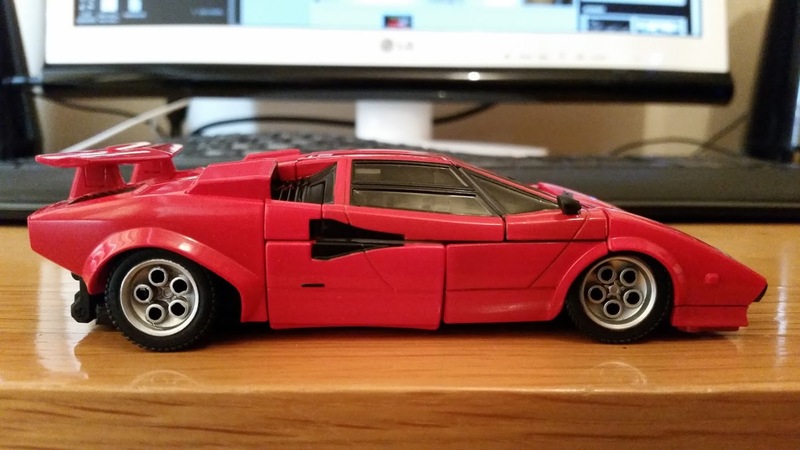 I think Sideswipe turned out great. The colors red are not the same everywhere, there are some color differences, but they are not that noticeable I believe. I do not mind anyway, just like I did not mind with Bumblebee. Glad that he is added to my Masterpiece collection. Now I need to get my hands on Red Alert. Sounds great, any chance of you posting some close-ups of the face (maybe with some clear lighting)? Was tempted myself picking this guy up from Kapow but I'm trying to stick to one of each character for the most part. Just given him a go, and whilst I got it better than it originally came, it's much better, but still a little wonky. Extreme close up always makes it look worse than it is. I'm new to the mold, so possible I've not quite go the knack of it yet either. Thanks for the pics, Chiller! Couldn't get a decent photo, camera kept on mis-focusing, best I can do for today. This was the best I got. The lips look far bigger in the photo than they do in real life. And you can't see the blues of the eyes here. Thanks for that. Any problems closing that head flap all the way down (doesn't look fully closed in this photo)? 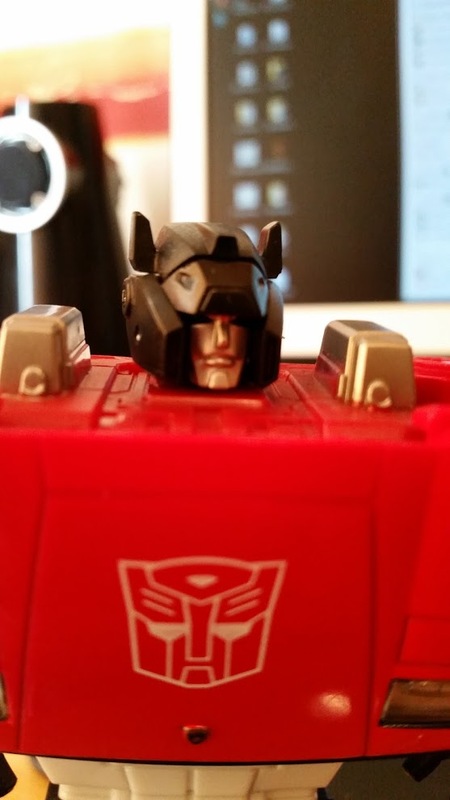 Have you transformed him into car mode yet? Curious if those panels line up better than the out of box pic you showed yesterday. I saw the reissue MP Lambors being sold by a toy vendor this morning. He, along with a couple of other sellers, confirmed that this version doesn't come with any additional "freebie" other than the coin itself. Would anyone whom has received theirs help confirm this?